Which Materials Are Used to Make the Durable Flap Wheel? Flap disc is a mechanical wheel which is made from abrasive flaps or strips radiating from a central hub. It works best for tasks such as stress relief and metal grinding. It plays an important role in the buffing process. Flap wheels come in many different grit sizes, shapes, bonds and weights of cloth. The outside diameter of the wheel usually ranges from 4" to 24" in most flap discs manufacturers. Some are even larger. The center hub holds the flaps together at the periphery. There are 3 types of hubs used, such as metal centered hub, cardboard core hub and heavy duty mechanical hub. Different hubs suit the requirements of different industries. However, metal centered hub has become an industrial standard because it provides a wide variety of applications. The most common material used in the discs is abrasive flaps, both woven and non-woven. Other materials include neoprene, buff cloth, cardboard, etc. 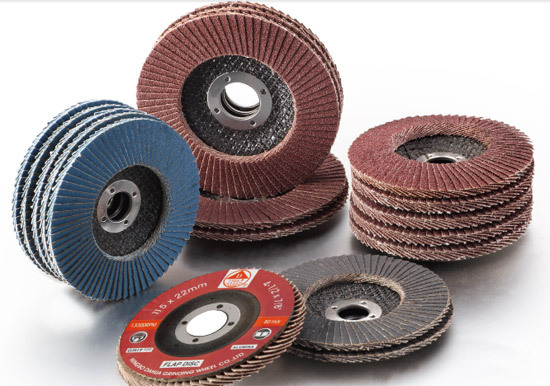 Flap wheel abrasives are grouped into 2 main categories, i.e. natural and artificial. For the natural abrasives, they are made from diamond, garnet, quartz and corundum. On the other hand, for those artificial abrasives, they are made of synthetic diamond, silicon carbide, aluminum oxide and so on. Flap wheel heads are designed to be flexible enabling the heads to conform to any shapes. Since they are able to conform to irregular shapes, you can skip many hand operations and indirectly increase your work efficiency. At the same time, it assists you to cut down your labor cost. You can simply start the finishing operation and the flap wheel will wear down to the exact contour automatically. Flap wheel is used for preparing the work-piece for further finishing steps, i.e. buffing, plating and anodizing. Sometimes, the wheel is used for de-burring and stress relief. Seriously speaking, it is in fact a unique grinding and polishing tool. If you need to remove metal stock or alter the metal surface, you can also make use of the wheels. What’s the Feature of Sanding by Flap Wheel Heads? Why Are the Cutting and Grinding Wheels So Popular?